A sustainable fish restaurant and take away in the heart of Notting Hill. Serving the finest quality fresh Cornish fish. Here at The Chipping Forecast we've searched the caves and coves of Cornwall in order to find fisherman using traditional techniques to land the finest, sustainably caught fish our waters can offer. 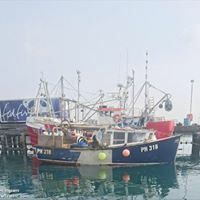 Each delivery of fish we receive, can be traced back to the boat and to the fisherman who landed the catch (many of whom are pictured on our restaurant walls). We guarantee from hook to Hill within 48 hours! Our fresh Cornish fish can be simply grilled, battered, gluten free or coated in Panko breadcrumbs. 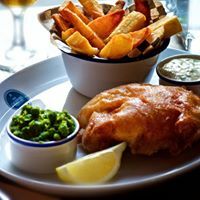 Fish & Chips is our signature dish and our accompanying hand cut chunky chips are tripled cooked in traditional beef dripping for an unbeatable taste. 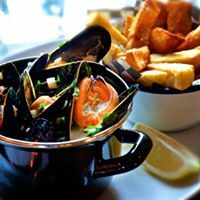 We serve daily grilled specials and popular homemade favourites such as a rich fish pie, salmon fishcakes, salt & pepper squid, salt cod scotch egg and lots of delicious side salads and greens. We offer accomplished seafood dishes by using the best available fresh ingredients, keeping it simple and with thorough attention to detail. Great food and relaxed athmosphere. We loved the crab on toast, grilled lobster, fish and chips, lager on tap and fizzy lemonade. Can’t wait to come back. Thanks for having us! Cute little place. Food was good, nice variety. Fresh and pretty healthy. Chips v good. We will go back. This was a really poor meal. Starters and mains delivered at the same time so the latter were cold when we got to them: the crayfish starter could've done with more fish and less veg; the croquettes were forgettable; my friend had to ask for her fish soup to be reheated, but she couldn't finish it as the mussels hadn't been cleaned properly and there was barely any other fish in the dark swill; my chips were stone cold and flabby rather than crispy; and serving a large portion of crab on toast on two separate plates makes no sense. The bread hadn't been properly toasted, but at least the crab was OK. And the poor waiter really needed someone to help him out. Will not be back. I know you have been told before but this was genuinely the best fish and chips ever. Super fresh cod, sublime batter which was crispy and not at all greasy and delicious chips (go for the beef dripping cooked). Fab friendly service, will be back. On our recent visit we enjoyed a dinner of deliciously cooked fresh fish. The squid, fish cakes and beer fried cod were all outstanding. I have eaten here on several occasions in the past and the food is consistently good. The staff are always charming and helpful. On our recent visit we ordered a couple of glasses of Prosecco, as an aperitif. I was very impressed to notice that Alex, the manager that evening, took the trouble ( without our asking) to taste from the bottle of Prosecco ,  already opened in the fridge. He decided it was not fresh enough and opened us a new bottle. We didn’t ask him to do this but I appreciated not being served or fobbed off with a glass of flat Prosecco. Especially as it’s Berry Brothers select. They have an excellent choice of wines and the puddings won’t disapoint  either. We’re lucky to have such a great local fish restaurants. Fish and chips were fantastic! Extremely charming service and very good food, although the portions of fish were a bit on the meagre side for the price. Best fish and chips I’ve had!! Great evening. Very nice place and food! Definitely go there once you visit London! Se si vuole mangiare un ottimo fish&chips questo è il posto giusto qualità del pesce ottima, frittura perfetta, non un goccio di olio sul piatto, leggera e croccante. Very kind and friendly staff. And nice food! Food was served cold, and had to wait quite a while for a whole new plate to be brought out. This restaurant is just great and totally amazing food. we will be going there again for sure. The Chipping Forecast is a great local restaurant. Consistently good food served by wonderful hosts. Fantastic experience. Lovely meal with impeccable service, in comfortable and clean dinning room. The fish was fresh and cooked to perfection. The chips, delicious, the peas yummy and the homemade tartar sauce was tasty. All for 15gbp it WAS a special. Thank you The Chipping Forecast from Canada. It has become our go-to fish and chips place. Great quality of food and service, and quite a unique atmosphere. Great fish and chips, kind personnel and lovely atmosphere!